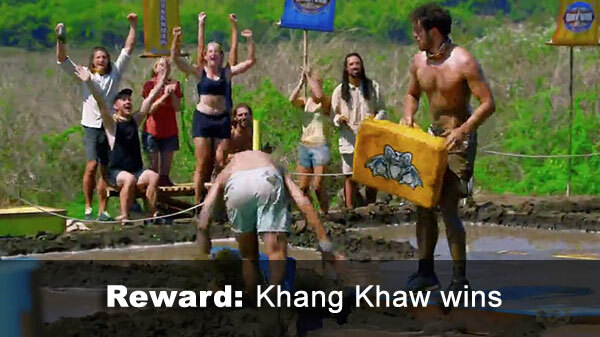 Ep.4 Reward challenge: "Sumo at Sea" - (In mud...) Khang Khaw dominates, convincingly, 10-5, wins "smoko" (coffee, tea, hot chocolate, cookies). 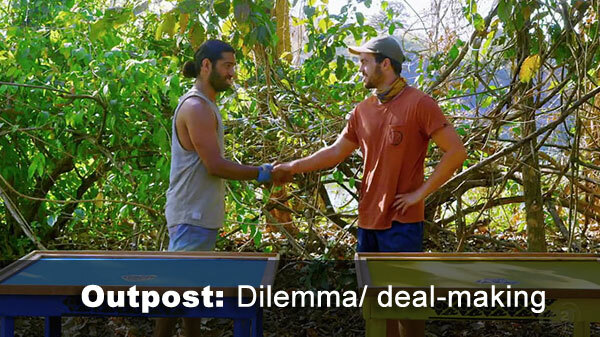 Ep.4 Outpost: Dilemma - Arun and Josh have to pick IC sit-outs for the next challenge. They will stay at camp, but also be immune at Tribal Council. Josh selects himself, admitting Khang Khaw wouldn't mind losing. Arun picks Eve. 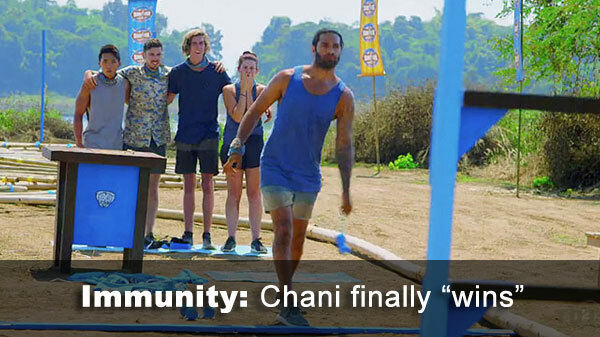 Ep.4 Immunity challenge: (Chains, obstacles, bolos) - Chani wins, as Khang Khaw takes a really long time to untie things. Ep.4 voted out: Kaysha, 5-2-1-1 over Dylan, Tess, and Adam, respectively. Notes: The fact that Josh had a choice in the matter means Josh & Eve's IC sit-outs should be counted as regular sit-outs and challenge "appearances," even though neither of them actually appeared at the challenge site. It's not like forced exclusion due to a swap, as with Julia Sokolowski in Kaoh Rong. 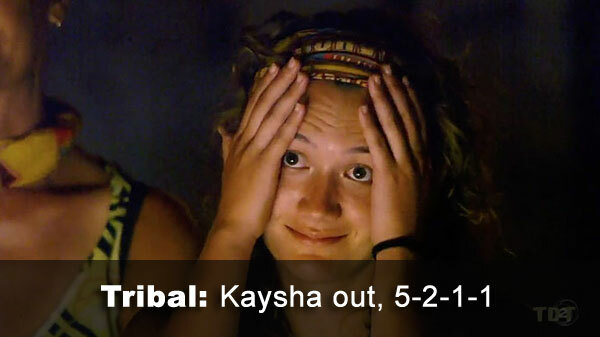 - Kaysha received 5 votes, from Adam, Brad, Josh, Matt, and Tess (voted out, 5-2-1-1). - Dylan received 2 votes, from Lisa and Tara. - Tess received 1 vote, from Dylan. - Adam received 1 vote, from Kaysha.